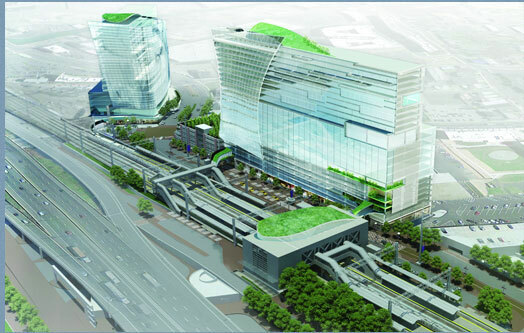 Beginning in the Spring of 2014, construction of a Transit-Oriented Development (TOD) project will start at the Stamford Transportation Center. This project will develop over several years to vastly improve the parking garage, accommodating a minimum of 1,000 spaces, expanding the availability of parking, and improving surrounding traffic flow for pedestrians. The TOD will also include approximately 600,000 square feet of commercial office space, 60,000 square feet of retail space, as well as a hotel with about 150 rooms and about 150 residential units. During this time, the two existing parking garages will still be available for use, as well as the same number of commuter spots as there are today. After the next three years, the new and improved Stamford Transportation Center will be more convenient for commuters and create better living and traveling space, as well as entertainment and dining in the city of Stamford. © 2013 Stamford Manhattan Development Ventures, LLC. All Rights Reserved.